OWNERS of smaller enterprises here may find it easier to take steps to achieve business excellence with the release yesterday of a new, simplified guide. The A5-sized guide has been put out by government enterprise agency Spring Singapore. It is a follow-up to a more comprehensive workbook launched last year, and comprises four pages of mostly simple infographics. The guide outlines the reasons and steps for business excellence, and introduces government schemes that can be tapped. Launched at the Business Excellence Award Winners Sharing Conference, it is the latest in a line of initiatives by Spring to mark the 20th anniversary of its business excellence framework. More than 700 small and medium-sized enterprises (SMEs) have used the framework in the past five years, with about 160 jumping on board in the past two years. The guide includes a three- step procedure where businesses first identify their own problems, work with assessors at Spring and finally improve operations based on recommendations from a Spring feedback report. Companies are then awarded a business excellence certification. Out of about 1,000 certified companies, 30 per cent are SMEs. An impact study done by the National University of Singapore in 2012 showed that certified companies had over 11 per cent higher labour productivity and more than 13 per cent higher profit margins than non-certified firms. Mr Matthew Lee, operations director of local SME, WEC Engineers & Constructors, said the certification served as a good benchmark, but the process and framework were more important. "It helped to identify many areas of improvement across departments, which we otherwise may not have noticed," he said. 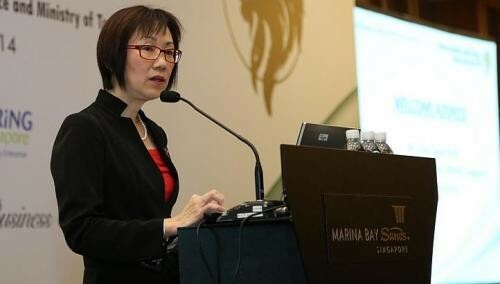 In her opening address, Spring assistant chief executive Choy Sauw Kook said the guide will encourage SMEs to use the framework. "All organisations... can use the business excellence framework to address their challenges, raise productivity and boost organisational performance." The conference held at the Marina Bay Sands Convention Centre was attended by more than 450 business owners and professionals, and featured last year's winners of business excellence awards, such as the Singapore Quality and Singapore Innovation Excellence awards. Speakers included the principal of Nanyang Girls' High School, Madam Heng Boey Hong, and Building and Construction Authority chief executive John Keung. Both organisations won the Singapore Quality Award last year. They discussed topics ranging from innovation, sustainability and service excellence to productivity. The discussions ended with a series of workshops held by past award winners. Officiating at the conference was Senior Minister of State for Finance and Transport Josephine Teo, who highlighted a common trait among business excellence winners - they have "a certain ambition to achieve beyond their present results, to do more". However she noted that change forced by circumstances, such as a tight labour market, is not enough. "For true transformation, we need to change because we want to... otherwise it will only be on the surface," she said. "Innovation has to be embedded in the way we do things... and underpin our whole economy."